It has been a really busy few days, and so packed with things to blog about that I decided to write about several things in one go - a Bad Witch's gossip page. First, the good news: Bali of The Atlantis Bookshop is the proud mother of a lovely baby girl called Aurora. I actually learnt about this happy event back in December, but was asked not to mention it on my blog until the news was public. Geraldine included a lovely photo of Aurora on the Atlantis newsletter, which I received yesterday, so I feel I can now share the good news too. If you want to see the photo, email Atlantis at atlantis@theatlantisbookshop.com and asked to be put on the list for updates. Now the bad news. 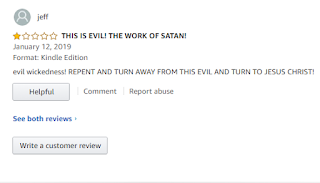 Yesterday, the publicity manager at my publisher, Moon Books, was really on the ball in pointing out to me that someone had left an abusive review of Pagan Portals - Poppets and Magical Dolls on Amazon's American website. You can see a screen shot of what the reviewer said to the right. 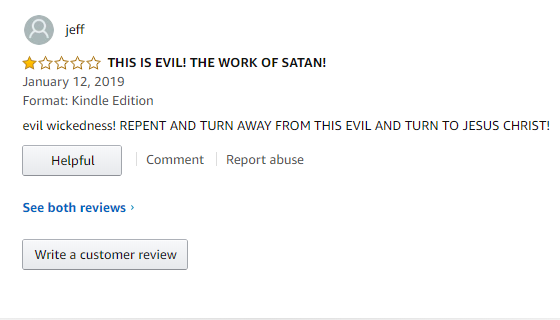 Apparently, my book is evil and the work of Satan. To be honest, I'm more amused than offended, but a 1-star review is never nice, even if I know the person who left it probably has more problems than I have. Now the weird news, which relates to the photo at the top of this post. For the past two days I have been at MagiCog - a conference at UCL in London exploring cognitive approaches to ancient magical practices. It brought together scholars of ancient cultures with specialists in cognitive approaches to magic, offering a wide ranging selection of brilliant academic talks. One of the speakers was Gustav Kuhn, from the psychology department at Goldsmiths. His topic was, Experiencing the Impossible: How Stage Magic Perpetuates Magical Beliefs. He started with a demonstration of stage magic and talked about fakery among spiritual practitioners. Things that seemed supernatural, could well just be tricks, he said. Immediately, things started to go wrong. His slides refused to perform correctly. The technical people were baffled. It was inexplicable and had never happened before. Then the fire alarm went off and we all had to evacuate the building. The picture at the top shows everyone gathering in the street between Senate House and the British Museum during the alarm. So, what was going on? Could the spirits have had the last laugh? That guy Jeff who hasn't read your book and any of the others he has been busy marathon trolling. He's hitting books that aren't evangelical christian in nature, or don't follow their doctrine. Not only did he hit your book but books about Catholics, Methodists, Lutherans, Hindus, Buddhists, Jews, Jehovah Witnesses, Natural History about Dinosaurs, Evolution, general science books, etc. People have been reporting him so hopefully they'll be banning him soon. Loved your book btw. Sorry to hear you had this to deal with, please keep up you great work.